This Program is your Key to help foster motivated and dedicated employees who feel valued so you can stay focused on managing your business to further achieve its overall success. Through customized training and an in-depth evaluation of your employment-related policies, we help you create a “healthy workforce”. Be Proactive, not reactive. Increased awareness of harassment and discrimination in the workplace can lead to claims which have a potentially devastating effect with high legal expenses, negative impact on employee morale, upset to Company reputation, and disruption to your bottom line. Separate training for employees and for managers including: Zero Tolerance Sexual Harassment and Discrimination in the Workplace; Conducting Effective and Non-Discriminatory Performance Reviews; Carrying Out Effective and Non-Discriminatory Discipline and Handling Complaints Effectively and in a Non-Discriminatory Manner; Proper and Appropriate Record Retention. Evaluations of all employment-related policies to help ensure compliance with federal, state and local laws, reflection of your unique business and goals, and the importance of valuing your employees to encourage their commitment to your company. A customized, thoughtful, collaborative approach to EVERY PART of your designed Corporate Wellness Program™. Invest through our cutting-edge Program in one of your most valuable assets– your employees. 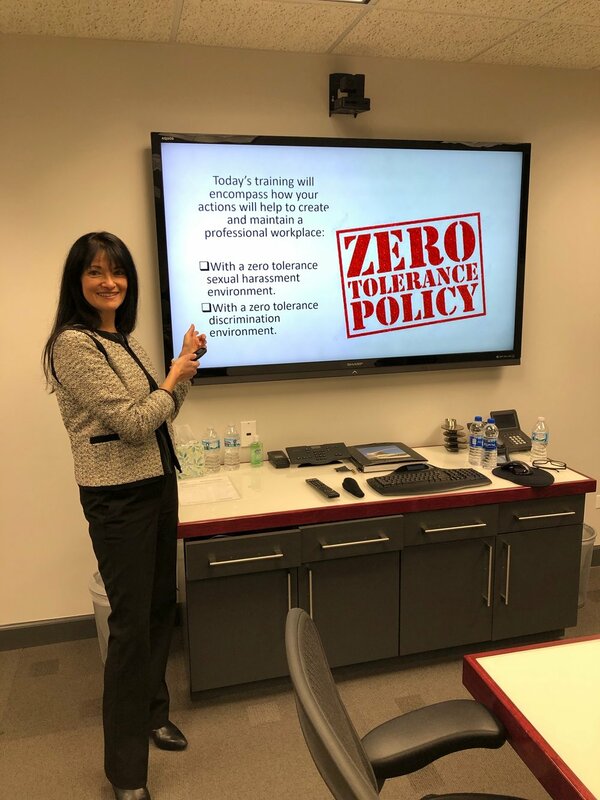 Caren Naidoff providing training to one of our clients on Zero Tolerance Sexual Harassment and Discrimination. Finishing off a great training session for one of our clients. Corporate Wellness, LLC is ready to train management and employees at your Company.